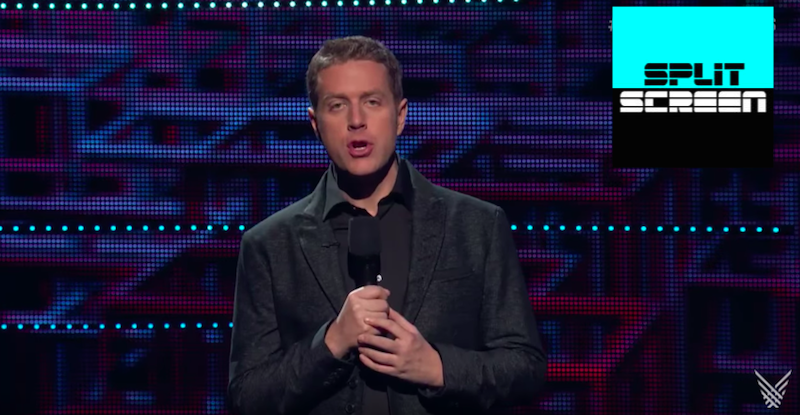 Veteran game journalist Geoff Keighley joins Kotaku Splitscreen this week to talk about what it’s like to produce The Game Awards, how he decides which trailer to debut, and the hilarious request he got from the people who make Doritos. First we talk about the Marvel Cinematic Universe (12:52), Skyrim’s composer’s disappearing Kickstarter, and the Destiny 2 debacle. Then Keighley comes on the show (41:47) to talk about The Game Awards, which take place on December 7. Finally, I share some gripes about the upcoming RPG Xenoblade 2 (1:18:14). Jason: One of the interesting things about The Game Awards is that it’s not just an awards show, it’s also a reveal show. You love your exclusive premieres... How much of your time is spent juggling those, and convincing publishers to give you their reveals, as opposed to the awards themselves? Geoff: Yeah, the show is an interesting hybrid as you said. We’re half an awards show, half a sneak preview of new games and announcements. Some purists will say hey it should just be awards, we don’t want these other games in there. Jason: If you want a tenth of the viewers. Geoff: Exactly, that’s the thing. Other people have run that experiment. And I say because we have the news in there, it creates a much bigger audience, all boats rise, and then millions of people are seeing these developers on stage winning these awards. I’ll go where the audience goes, and the numbers tell us that people are tuning in for the excitement... The reveals and announcements, it’s different every year. When we first started Game Awards, it was challenging to explain to people what we were doing. But then we had like, Mr. Aonuma and Mr. Miyamoto gave us the first gameplay of Breath of the Wild at the first Game Awards in 2014, which was insane. And we didn’t even know about that until a week or two before the show, when they sent us this video. That year they had shown that very brief teaser at E3, which was like 30 seconds long, and we heard that maybe they’d show something at Game Awards but it’d probably be just that scene, and we’d show it’s real time. And I was like hmm OK, again, it was my first year, so I’m like anything from Nintendo would be amazing. I basically go out and explain the show to everyone, I have a list, I pretty much canvas every major developer and say hey what’re you working on, would it make sense to do something at Game Awards? Sometimes they say yes, sometimes they say no, and oftentimes they say let’s think about it. Like one of our big reveal trailers next week for a game is something that maybe only came together in the past 4 or 5 weeks. It’s an amazing game that I didn’t even know was in development. It just sort of popped on my radar, and I said show me something from it, and I’m like wow this looks really incredible, it’s going to take your studio to the next level, and gamers are going to love it. There’s a lot of that and there are also some games we get pitched and just aren’t the right fit for what we’re doing. It’s nothing against the developer or the game, it’s just we want to have the right mix of games in the show, a diverse group of titles. So yeah, it’s just a creative process we go through with a lot of the teams. For the rest of the discussion, check out the full episode. As always, you can find Splitscreen on Apple Podcasts and Google Play. Leave us a review if you like what you hear, and reach us at splitscreen@kotaku.com with any and all questions, requests, and suggestions.